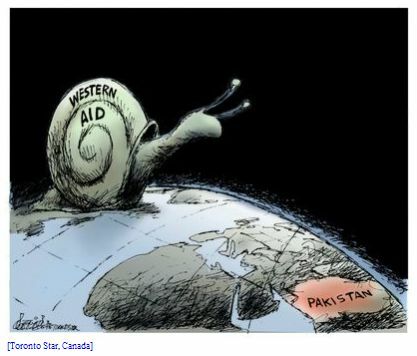 Could it be that India – with American backing and Afghan connivance – has engineered the worst flooding in Pakistan’s history? And to what end? Most would call it a conspiracy theory, but columnist Ahmed Quraishi of Pakistan’s Pak Tribune is dead serious as he outlines how India, by opening up dams it controls up-river from Pakistan, is intentionally causing flooding that has affected up to 20 million Pakistanis and covered almost a fifth of the country. It has been two weeks since the rains stopped but the Indus and Chenab rivers continue to rise. Further, there was no flooding in India or in Afghanistan. Never before have rivers in all the provinces of Pakistan flooded at the same time without a similar act affecting sources upstream. … The speed and quantity of the gushing water, and the short span of time in which it picked up momentum, precludes the possibility that melting glaciers are solely responsible for the floods. After the first wave of floods, most rivers were flowing normally and no extraordinary rains followed. But suddenly, the Chenab and Indus Rivers overflowed and the flow picked up speed, turning into a flood. India’s Baghliar Dam in occupied Kashmir opened its flood gates to cause a tragedy on the plains of Pakistan [Sindh and Punjab]. The Sarobi Dam – the Indian-maintained dam near Kabul – controls the flow of the Kabul River entering Pakistan. The same thing happened there. Monsoons didn’t lash Afghanistan and there was no flooding there of any magnitude. But again, strangely, water flowing from the Kabul River into Pakistan dramatically picked up speed as water levels increased, turning into a flood. The speed with which this transformation occurred could only have happened due to one of two reasons: massive rains in Afghanistan or the release over a sustained period of large amounts of water by the Sarobi Dam. How Pakistan responds to this latest Indian water war and aggression is something that remains to be seen. What is certain is that the incumbent pro-U.S. government in Islamabad is useless when it comes to defending Pakistani interests. … These Indian dams now need to be destroyed. India has declared war on us by exploiting and orchestrating these floods.